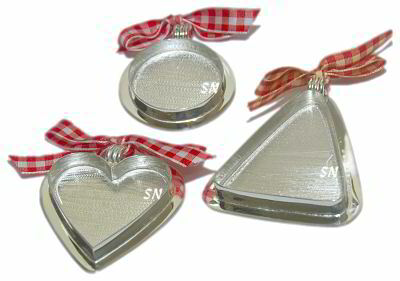 "Sweet Nothings" from JBW designs are just the thing for a special person or occasion! Judy has a set of -- well, we've lost count! They come as little 4 x 5 cards, with a color cover of the stitched model. 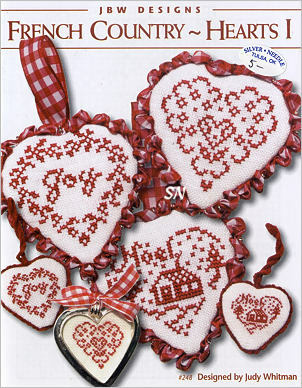 Most use beads, buttons, or the glass Treasures from Mill Hill. Her color palette is almost always soft and pastel, but the Christmas and Halloween designs follow the traditional color themes. Just beautiful, some of these are perennial best sellers! We have a "Baker's Dozen" offering on these... choose any 12, and get your 13th FREE! I know it's hard to choose... but we can do that part for you, if you want!!! Be sure to mention the web special in the comments box of the order form. 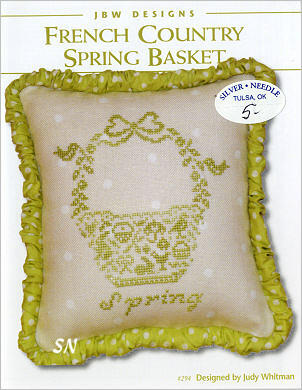 JBW's Spring 2019 Market kit is here... it's a small scissor 'basket'... an envelope! 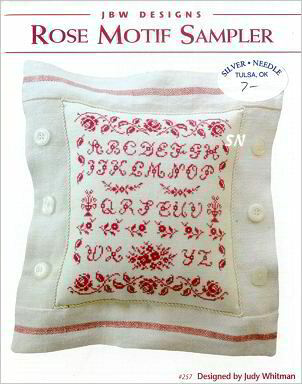 Presented as a kit of chart, 32ct antique white linen, floss for the cording and green backing/lining fabric (you can see it in the pic), and pink flower buttons, you add bits of floss from your stash. 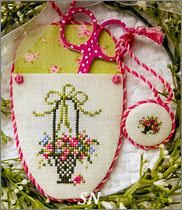 Finishing instructions are included to make the 3-1/2 inch scissor pocket and tiny matching fob. 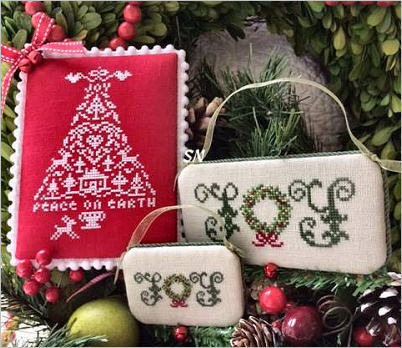 JBW has a couple of new ornament designs that come with their colored stitching linen, backing fabric and a bit of coordinating trim. 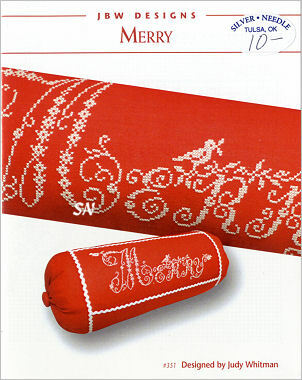 Peace on Earth is worked on 28ct Christmas Red linen and finishes 3-1/2 x 5-1/2.A pair of shiny red jingle bells are in here, but not that bit of red ribbon. Joy is done on 32ct Water Lily linen either over one or two. You'll need bits of three different greens to stitch this, but the green floss for your cording and a bit of greenery are included. Very *JBW* in personality! 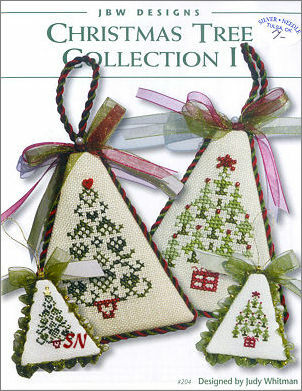 Small card format for each of these, they finish into mini-stockings or the little wooden sled ornaments. Sledding Santa & Sledding Snowman -- Ready to deliver their packages, stitched areas are only approx 25 x 50 stitches, charted for hand-dyeds or DMC. 16 or 32ct for the sleds. 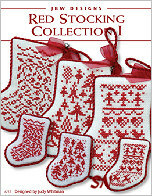 Merry - Stitched only in white... choose a pretty red or green fabric -- your choice for this! 198 x 70 in stitch count. Finish into a pillow or block stand-up. 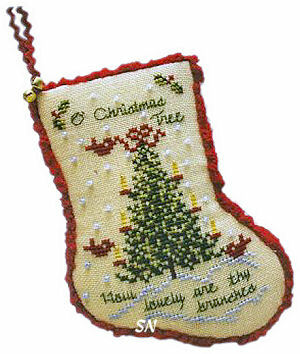 Sing A Song of Christmas #'s 7, 8 and 9... more little Christmas Carol Stocking ornaments! 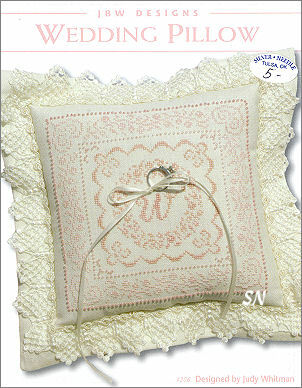 These all finish approx 3 x 4 on 32ct Antique White Belfast Linen, and are the cutest! 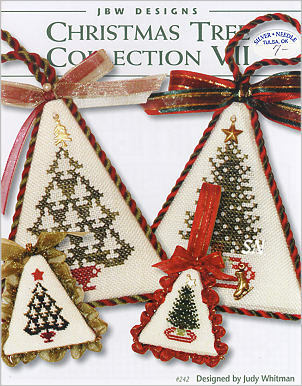 Nine now in the set, finish them flat, or actually make bitty stockings for candy canes or bits of greenery. 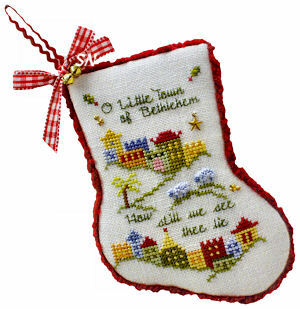 O Little Town of Bethlehem, Rudolph the Red-Nosed Reindeer and Winter Wonderland are the featured songs this time around, the other 6 previously released are still available for your collection! 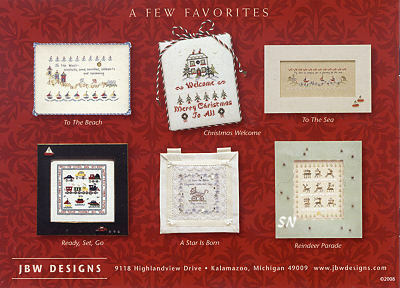 Judy Whitman has 5 new small designs -- Christmas, Americana and just plain 'ole everyday! Presented in her small card formats, everything is coded for DMC floss, some use hand-dyeds as an option. 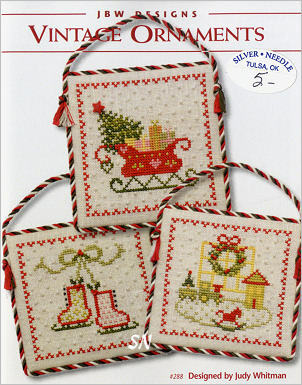 346 Christmas in Williamsburg -- Super traditional berry basket motif... it's only 30 x 30 without all the border treatments. 347 Christmas Tree Collection IX -- Stitched on red 32ct... these really look nice over one thread, and really show up against the branches of a green tree. 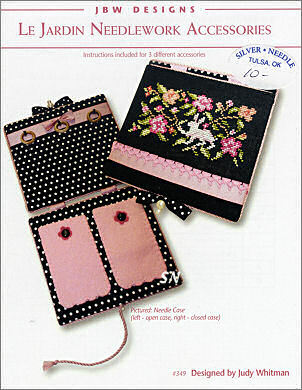 349 Le Jardin Needlework Accessories -- A charming trio of small designs all stitched on black linen. All the pink accents really look great with this, very basic finishing instructions. 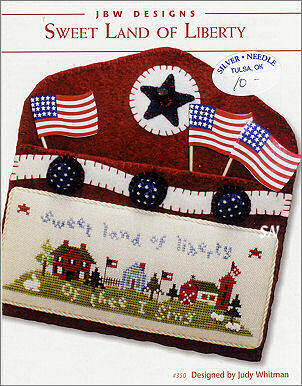 350 Sweet Land of Liberty -- A miniature home, school and farmyard scene, this measures only 2 x 6. Cute block on your window sill, or a little wedge stand-up as well. 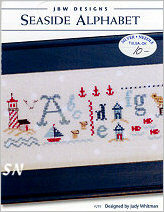 Judy has 4 new small carded designs... Seaside Series III and IV, along with *With Love* and *Ode to Britain. 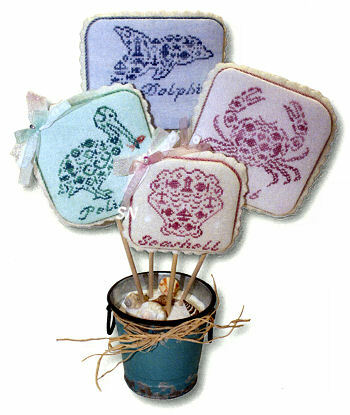 * She loves her country French look and continues those in the little sea creatures -- you can choose any color you want to work them -- and any fabrics. With Love needs to be done with a pretty red or rose-colored hand-dyed thread -- it measures about 84 stitches in size... over one, it'd be gorgeous! Ode to Britain is fun... little motifs scattered all over in here. I'm not sure if it's England, Great Britain, or the United Kingdom (which the Post Office says doesn't exist!)... but I've visited there and loved every trip!!!! 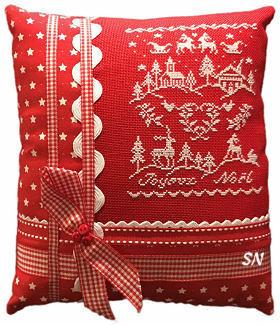 Joyeux Noel - This is the third small pillow like this from Judy, it measures 80 x 107 in stitch count, and can be stitched over one (3 x 4) or over two (5-1/2 x 6-1/2) on 28 or 32ct. 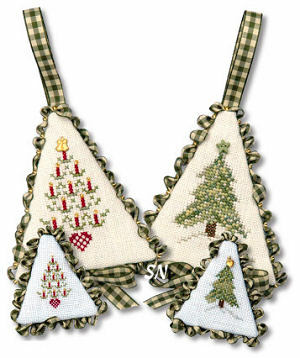 Companioning Tidings of Joy (#311) and O Christmas Tree (#326), she has both matching designs pictured (charts are available separately) on the inside of this chart - one stitched with white on red, the other is red on white fabric. SO... you can now have a trio of these, and since the pics of the matching two are so beautifully presented, you'll have a decision to make about fabrics and threads! 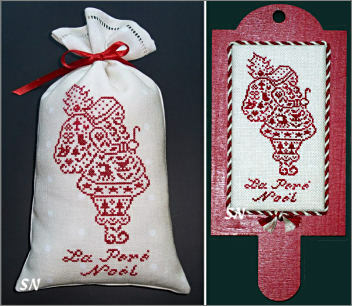 Sweet Christmas Bags - More small bits of white on red... you'll notice that most of these are take-outs from the Joyeux Noel chart. 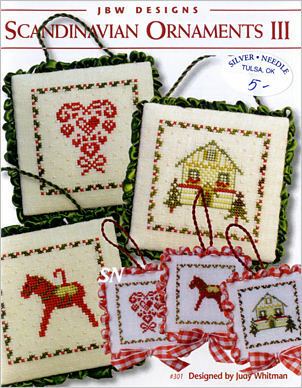 Stitch them over one or two and finish into flat ornaments, fobs or small bags like shown. Tuck in a little candy cane or a bit of greenery... you could even add a gift card or some small treasure! 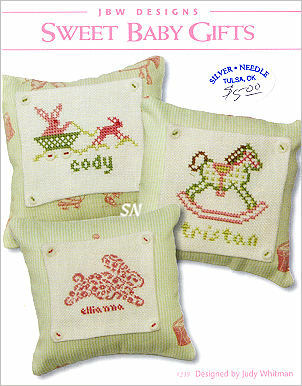 Each of the designs finishes less than one inch in size when stitched over one thread. 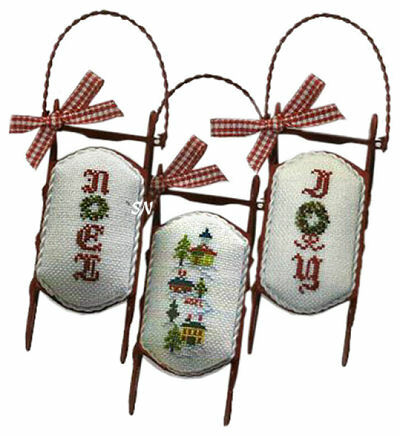 Little Red Sleds - A trio of designs stitched and mounted onto the Foxwood Crossings wooden sleds - you have to paint the sleds red - they do not come that way! Go over one on 28ct and use the baby-sized sleds... go over two on 32 and you can use the medium sized sleds. (Confusing? Just ask us to get the right thing!) Charted for DMC or hand-dyed flosses, they are super quick to stitch and finish! Sing a Song of Christmas: Away in a Manger, Hark the Herald, and O Christmas Tree are this year's songs to celebrate... they join last year's #327 Over the River and Through the Woods, #328 Here Comes Santa Claus, and #329 Frosty the Snowman. 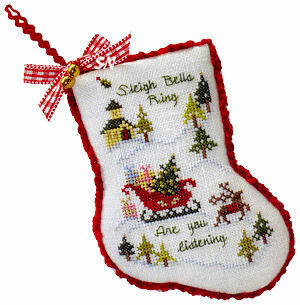 Finishing into 3 x 4 inch stockings, brass charms included where called for, the beads come from your stash. Super-cute, we've seen these done over one and they are DARLING! JBW has seven new designs... I'm into Paris these days, so these two are my favorites! 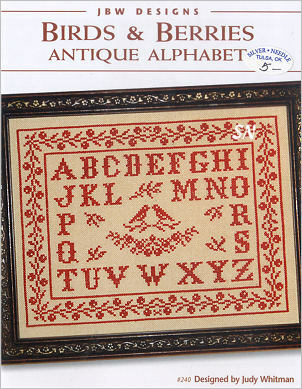 Alphabetique is presented as a small chart, it is stitched in one color of hand-dyed (Cherry Wine in this one) and finishes approx 5 x 9 on 32ct Platinum Belfast Linen. 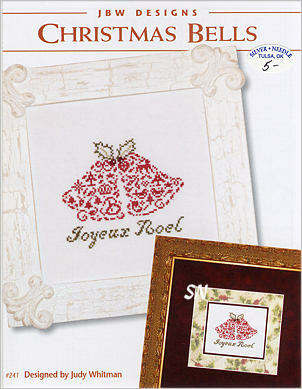 Lots of bitty French-flavored motifs in here, the letters are all swirly and pretty, everything is charming! 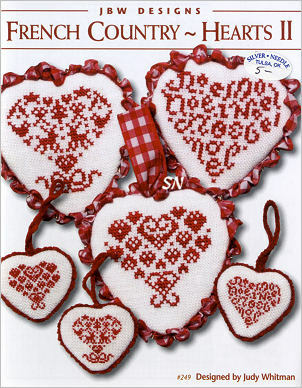 Think about stitching some bits separately for small cushions... you could turn this into a whole set of small cushions! 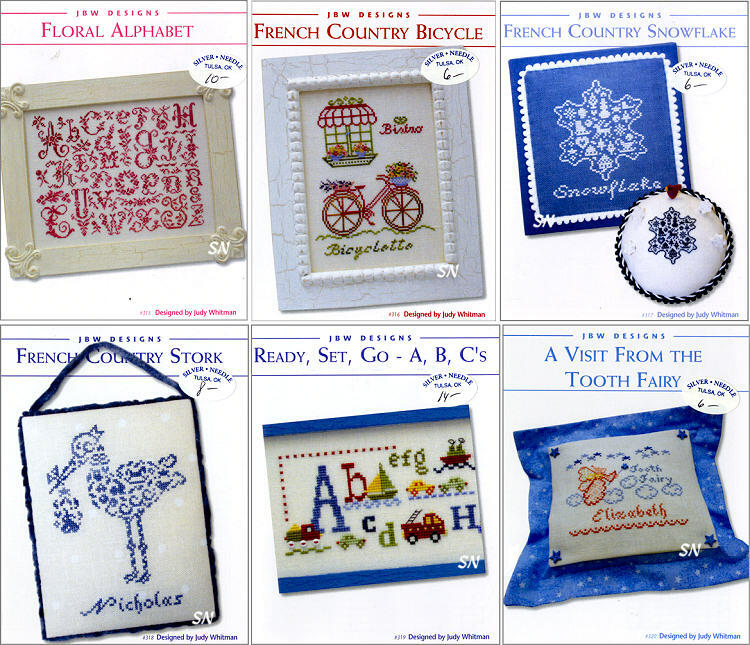 Judy suggests antique button embellishments here and there... none come with the chart... but find some old white ones to dot your needlework! Little French Pin Keep -- This is companion to Judy's Oh La La Eiffel Tower Scissor Case from last year. (That is now offered in chart format, #333, so you can still get the design!) Presented as a kit, you get the chart, pink finishing fabric for front and back. the rik rak, heart buttons and the cut of 32ct Baby Pink Linen to stitch on. All you'll need is a bit of DMC 601, 602 and 605 from your stash! A sweet little thing, the pins featured in the pic are a fun set by JABCO, and are available separately! 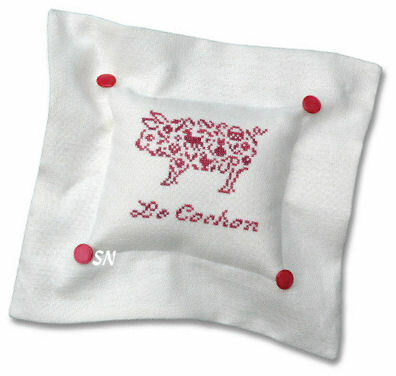 Lots of other pretty Country-French-Inspired designs, the baby one presents you an AWESOME finishing treatment! 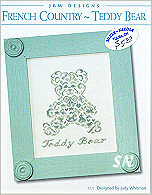 Those shadow boxes are sold at Hobby Lobby -- lots of the time they are even half-off! 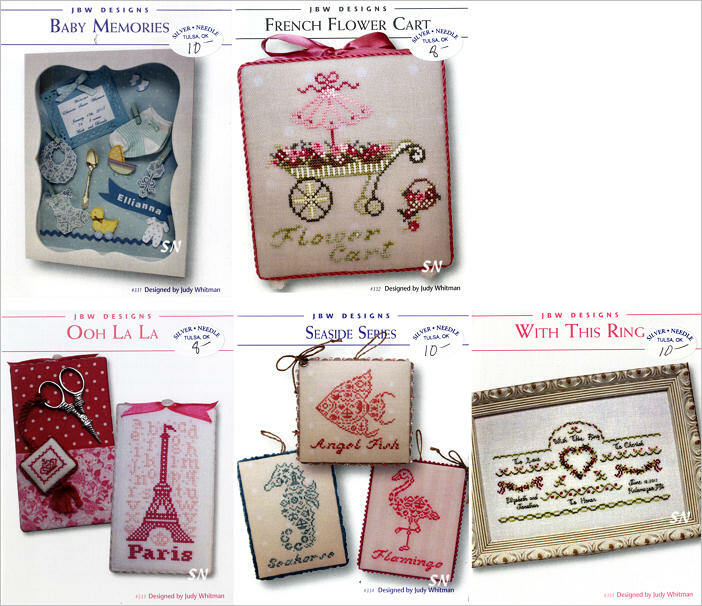 Choose from a million sizes, add bits of your stitching and some cute baby momentos, and WOW, what a darling new-baby gift! 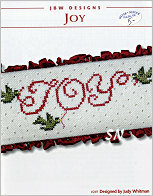 Sing a Song of Christmas -- This is a three-card series celebrating Christmas Carols! 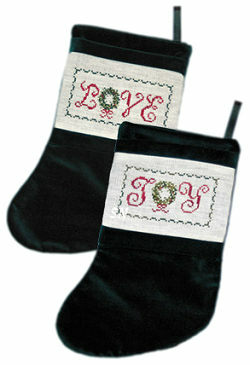 Finished into 3 x 4 inch mini stockings, they are coded for DMC or hand-dyed flosses -- your choice. #3 is Frosty the Snowman. 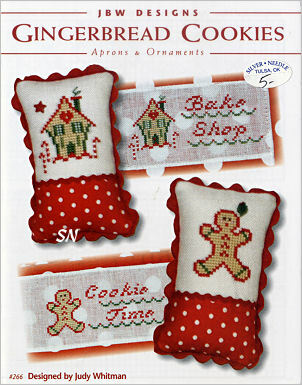 You can see the red trim along the outside edges -- that is Lady Dot's Sizzle Red Chenille trim -- which we carry. What a pretty presentation for this design! 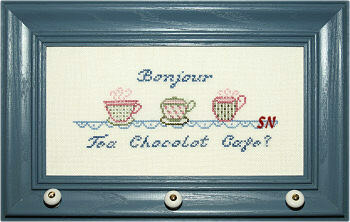 Stitched over two on 32ct, the design finishes approx 5 x 7. One way shows it stitched in just white -- you could choose any color of fabric and match your finishing fabric (like all greens or all blues) or in any color on white material. Add metallics or opalescents if you want... I love that pillow finishing treatment. Kind of a Partridge in a Pear Tree kind of thing, this is shown stitched over one thread, but charted regularly, so you can work it over two. 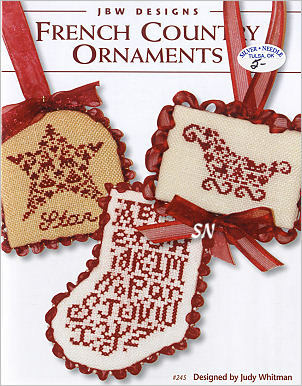 Hand-dyeds of DMC's, it's a festive stack of tiny motifs! 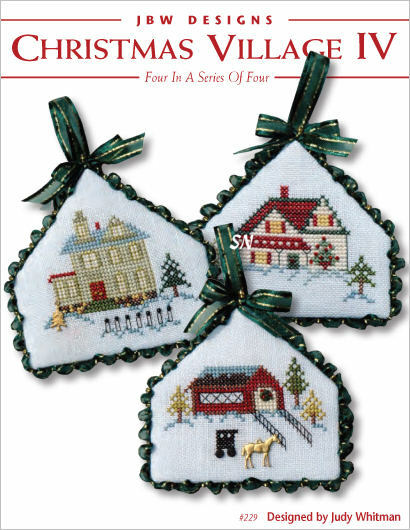 Get out your black and white floss, or counterparts in your hand-dyeds, to stitch these 4 simple seasonally-inspired designs. Work then over one or two choosing any count you like. Lots of finishing possibilities as well. 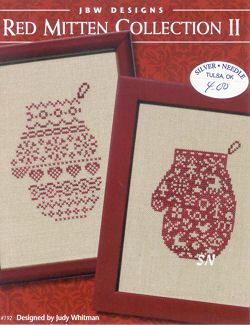 Judy has them finished two different ways in each small card chart... so lots of good ideas. Each measures 50-ish x 50 stitches -- the crow and ghost are a bit larger, but still on the petite side. Presented as small Sweet Nothings Cards. 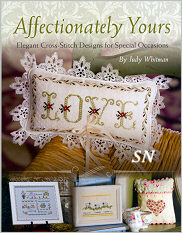 Judy Whitman has 6 new releases that we needed to show you!!! 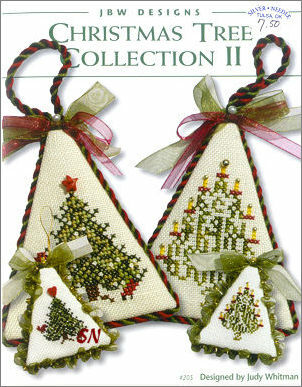 All are offered in her small card format, embellishments -- if called for -- are included with the chart. 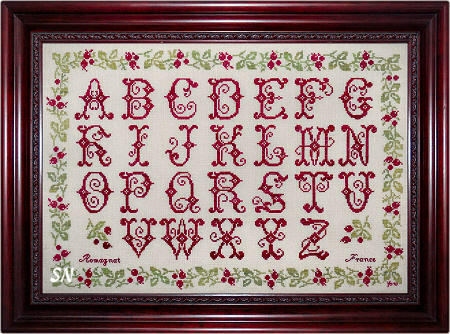 Floral Alphabet #315 -- I LOVE this!!! 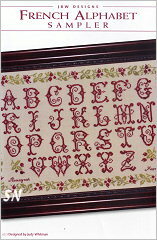 Measuring 148 x 114 in stitch count (9 x 7 on 32ct), this is a gorgeous flowing alphabet worked in only ONE hand-dyed thread color (which can be any color you want!!!) Frame it, pillow it... very elegant. French Country Bicycle #316 Classic French motifs of flower baskets, lavender, a cafe and bicycle all brim with charm. Stitch it on any cream color with hand-dyeds from your stash. Finishes approx 4 x 5. 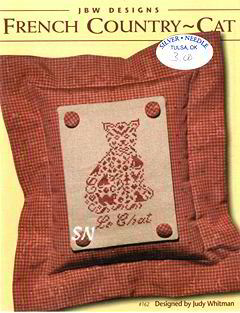 French Country Snowflake #317 -- Her pattern shows several different fabric and thread options for this... a pin cushion, add the letters or not... without the word, stitch count is 48 x 57... and if you did that over one on 28 Lugana... you'd have a 2 x 2-1/2 in mini ornament!!! 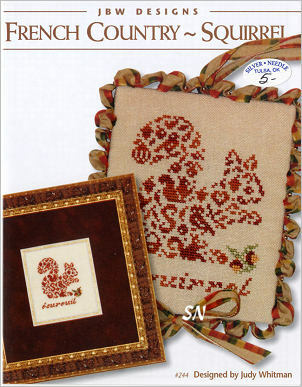 Country French Stork #318 -- A New Baby Classic! Stitched on Polka Dot linen... the pastel stripes would be pretty too... or something even solid pastels -- match your thread to your fabric color. 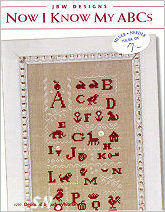 A complete alphabet and set of numbers is here for personalization.. stork is approx 65 x 70 stitches by himself. Ready Set Go! #319 TOO CUTE! This is full of bright colors and lots of tiny 'wheel' buttons -- 22 of them!!! Cars, planes, trains and lots of other things to get your little guy from one place to another in his imagination, this would make a really cute bedroom decoration -- especially with a special name on it! 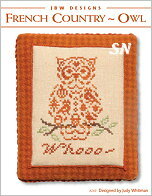 Stitch count is 198 x 40 -- finishing approx 2-1/2 x 12! A Visit From The Tooth Fairy #320 -- For quite an important occasion... get this NOW so you are ready for the first *big night! * (Remember it could happen at Grandma's House!!) It is stitched on opalescent fabric -- we have 28 and 32cts as well as some super-pretty pastel opalescent Aidas as well -- lots of options for this 68 x 53 design. 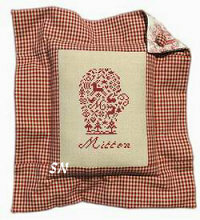 The prefinished pillow treatment has a small tooth pocket on the back. JBW has several new designs -- 7 more actually -- but I absolutely love this one, so I chose it for Just Arrived! 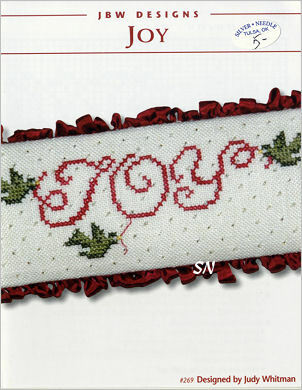 Choose any color of Red over-dyed floss or silk you like, stitch this over one or two threads, and finish it like either of these two options!!! 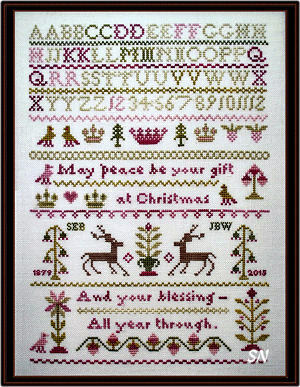 Sweet little reindeer surrounded by evergreens and a pretty border, this stitch count on this is 91 x 110. Presented in small card format. 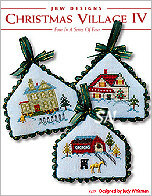 Christmas Tree Collection VIII #309 -- More of these bitty trees, you have the option to stitch them over one or two threads. The card comes with a pear charm for the over-two... but you'll need the regular and petite seed beads for the other options. (charm selection is a little confusing as others are shown that are not included.) 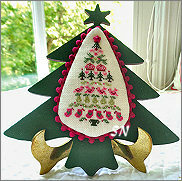 We have something like 18 of these different little trees -- they are CHARMING! 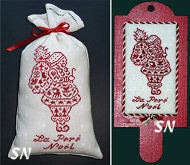 French Country Santa Pere Noel #310 -- 53 x 107, he is full of tiny motifs -- and stitched in one shade of red hand-dyed. 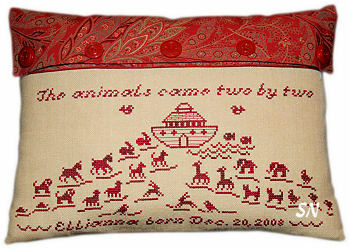 Trees, stars, reindeer and a sleigh... it's all in there! 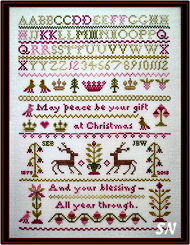 Peace at Christmastide #312 -- Adapted from an antique sampler in Judy's collection, 'May peace be your gft at Christmas and your blessing all year through. Trick or Treat #313 -- A little bag stuffed full of halloween motifs... they'd be cute just on their own as well! Alphabet Owls #314 -- An owl of alphabet letters! Stitch him in just about any colors you want... there are several options for charms to hang off the bottom... yours will be an assortment of 4. 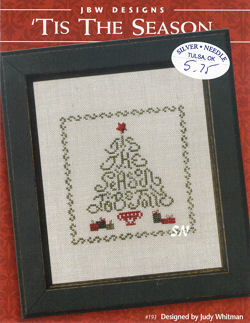 This is a kit to work up the chart over two threads on 32ct Cream Belfast linen. You get the chart, needle, linen, and the yellow calico fabric, orange rik-rak and trio of pearl buttons for the pin cushion version on the left in the picture. You'll need bits of hand-dyed floss or DMC from your stash. Not much of it... the stitch count on this is a mere 41 x 28. 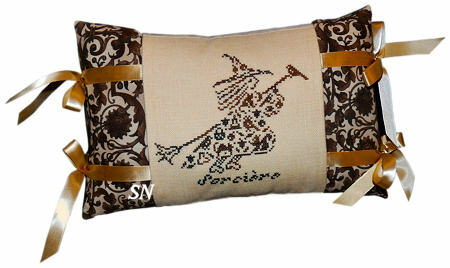 This is the CUTEST little Tooth Fairy Pillow EVER! A limited edition, this is ready-made tooth! 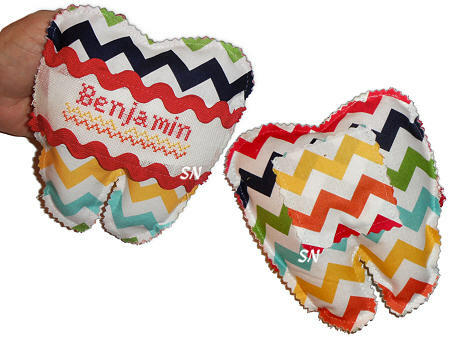 It measures approx 5 x 5... is sewn out of a multi-colored zig-zag stripe fabric and features a band of 30ct linen for personalization. Softly stuffed, it features a small pocket on the back for that precious tooth, and an alphabet to spell the 'important presenter's' name. DMC color numbers are supplied so you can match the colors in the fabric stripes. Judy Whitman has sent a charming set of new designs... 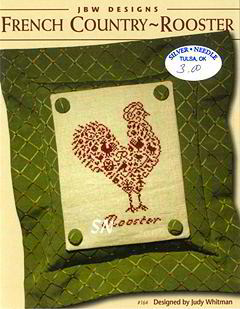 I think the Antique Rooster Sampler is my favorite. Mostly monochromatic in theme this time around... everything is offered in her small card format, The Antique Rooster Sampler being the only one with separate embellishments. 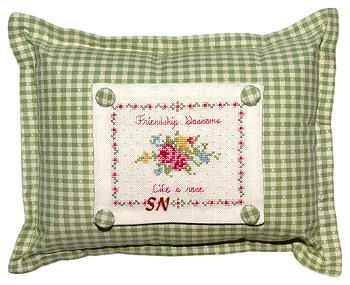 *Joy of Living -- Joie De Vivre -- Just a simple sentiment surrounded by a simple border... tucked into a lovely fabric bolster pillow, this is perfect for an elegant guest room. 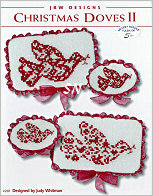 Choose 498 DMC red, Schoolhouse Red from Gentle Art... or something pretty from your stash. 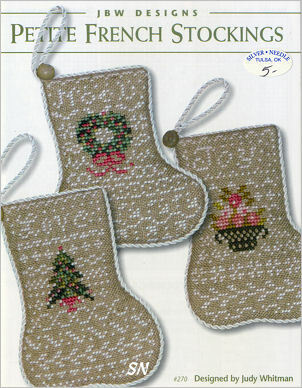 Finishes approx 4 x 10-1/2. 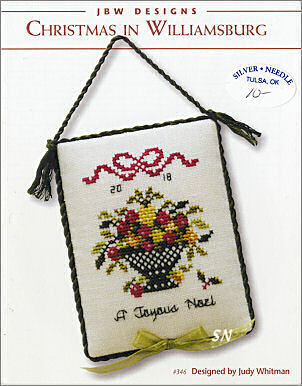 *Monogrammed Tulips -- A stitch count of 85 x 85, this finishes approx 6 inches in size on 28ct. 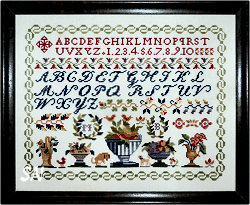 Pretty curves in this geometric design, choose the featured monogram from the included alphabet. Think about adding a few beads to this!!! 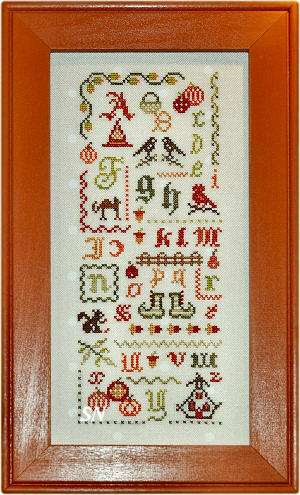 *Birth Sampler -- 'You shall see wonders' is the promise on this sweet birth sampler. Verse by Shakespeare, the border is from a 1733 Pennsylvania German sampler and the alphabets were found in a red and white 1876 sampler. 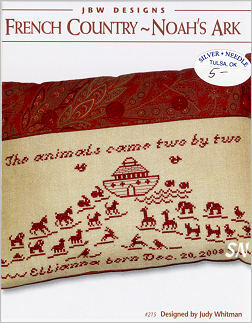 The trees, sheep, rabbit and borders also appear in early works. This finishes approx 7-1/2 inches on 32ct. 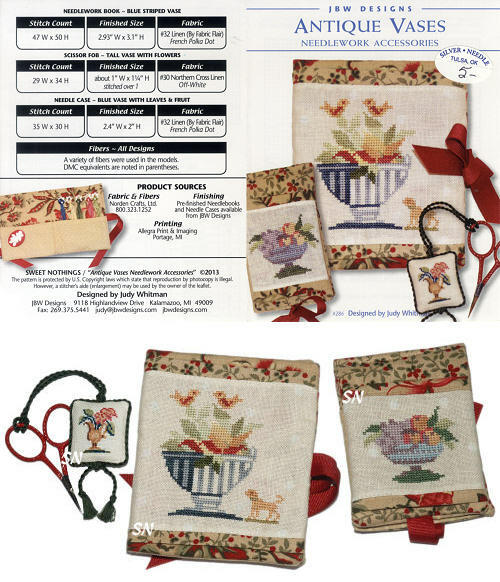 *Antique Rooster Sampler -- Finishing approx 15 x 5-1/2 on 32ct Judy has chosen motifs and roosters inspired from antique French samplers and some in her personal collection. 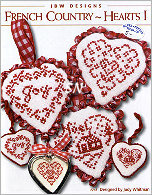 Scatter her set of buttons in between everything, or find your own from a family button box... stitch this is the traditional red, or another pretty hand-dyed. You choose!!! *Country French Elephant -- Little circus motifs here and there inside this elephant pull-toy, what a cute birth announcement! Stitched on 32ct French Stripes fabric -- the neutral shade -- you could choose either the pink or blue stripe options as well... or the Polka Dot! 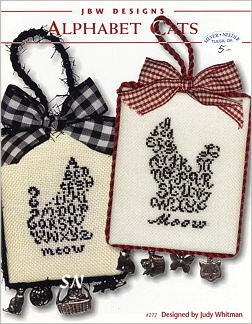 The card includes alphabets for personalization. *French Country Snowman -- This little guy's tummy is full of winter skates, flakes and birds! Stitched on the Fabric Flair 32ct Polka Dot Linen... you could pillow him... make a little cube stand-up... lots of things. Offered as a small card, he'd be cute on the striped fabrics as well!! 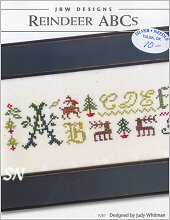 This is a small format booklet designed to teach the beginning basics of Cross Stitch. 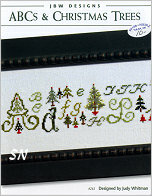 Judy has very simple instruction in here, very simple motifs to stitch and explains needle threaders, counting the symbols on the charts... even how to thread the needles and chart your name. 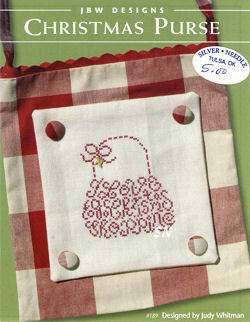 PERFECT to help a young stitcher... this would be a neat booklet coming from Grandma. 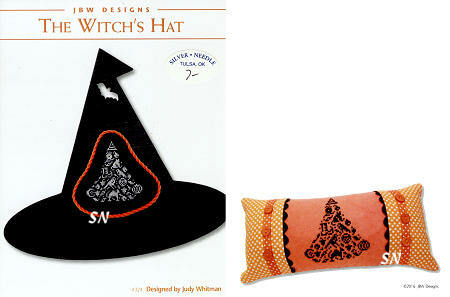 French Country Witch -- she's got bitty cats, crows and acorns in her dress! 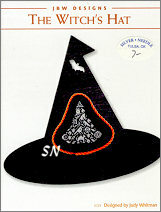 A different take on Halloween -- stitched with only one color of hand-dyed black. 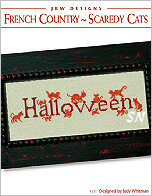 Halloween Alphabet -- A petite piece -- 4 x 9 on 32ct, it uses 11 different shades of overdyeds -- but you might be able to get away with fewer if your stash is good! 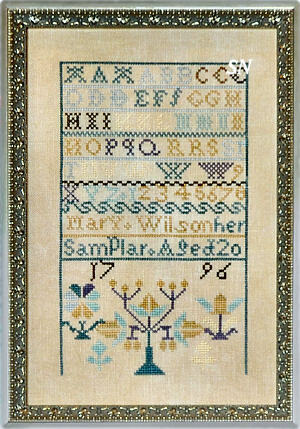 Miss Mary's Sampler -- 5 x 8-1/2 on 32ct linen, Judy has re-charted this 216 year-old sampler! Both old and new colorways are offered. 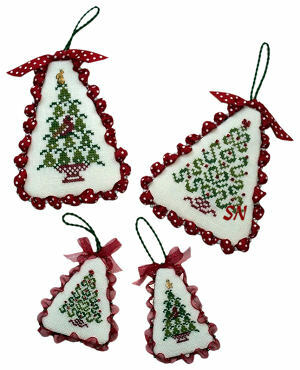 Scandinavian Ornaments I, II and III -- A set of 9 designs stitched on opalescent or antique white linen they finish between 1-1/2 and 2-1/2 inches depending on your choices. Can you see the dots in the backgrounds of the larger models? There are single stitches of opalescent #4 Braid on them! 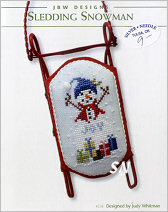 A softcover book of 64 pages, this features lovely photos and instructions for 11 projects. An Engagement Pillow, Bridesmaid Gift, Ring Bearer Pillow, Wedding Quilt Sampler, Brides Handkerchief, Birthday Heart Sachet, Housewarming, a pair of baby and birth samplers, and two Anniversary samplers! 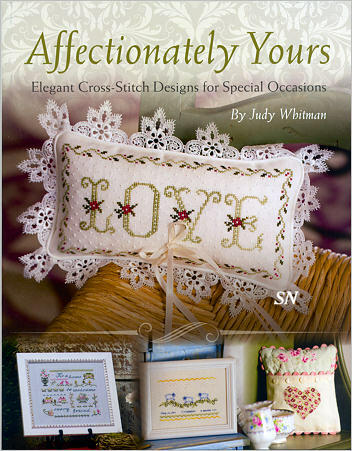 All the lovely creations of Judy Whitman, everything is pastel and delicate. Finishing instructions are included as well as wholesale product sources that can direct you to shops that carry everything you need! 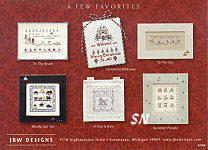 JBW has several new designs... all presented in small card format charts. 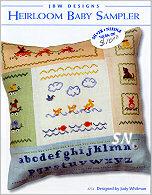 Seaside Alphabet is a companion to Great Pumpkin, Christmas, Reindeer and Hearts! It's a scattered alphabet that meanders through lots of individual motifs to set its theme. Stitched in dusty nautical blues and reds, there are tiny lighthouses, sailboats, flags, fish and even a little sand-colored seagull. Finished size is approx 2 x 16! A Friend So Dear is a BEAUTIFUL piece!!! (Actually, I can't believe it's offered in this petite card format!) 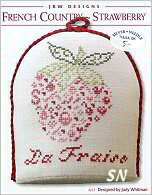 Finishing approx 6-1/2 x 12, the verse is lovely, and the motifs are charming. Everything is divided up by very pretty borders. *How sweet it is to have a friend so near and dear. * 28ct Confederate Grey linen, this is stitched in a medley of hand-dyed flosses or DMC. Nothing called for embellishment-wise... but you could always add some heart charms or a few buttons or beads if you have just the right thing! 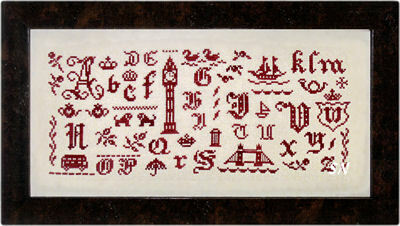 Now I Know My ABCs -- Stitched completely in red and white, this piece measures 62 x 166 in stitch count. 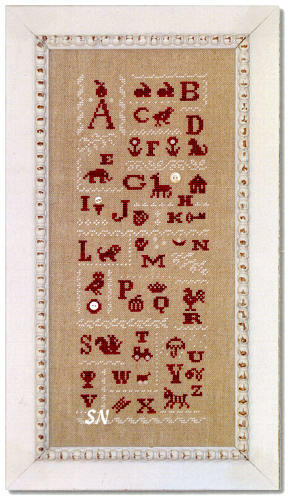 It features all the letters of the alphabet with corresponding itty bitty motifs -- and everything is divided up by the lacy white borders. 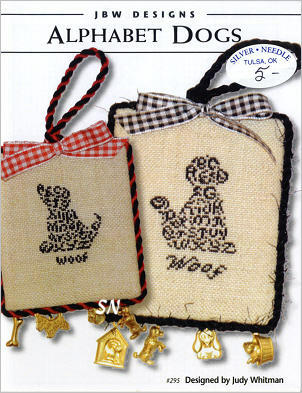 Alphabet Dogs -- Check out those darling little pups! 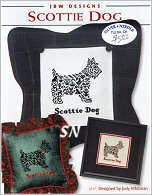 Stitched only in Black, depending on the fabric you choose, they will finish between one to three inches in size. See the charms dangling from the models in the pic? All of them are included in the optional charm pack. 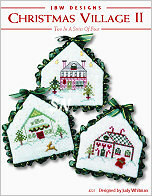 And... Judy is donating part of her sales from this pattern to TADSAW -- an organization that trains Medical Alert Service Dogs and provides them free of charge to our returning Soldiers. A sweet set of designs. 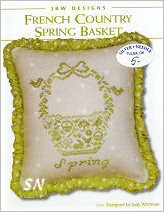 French Country Spring Basket -- Stitched on 32ct Fabric Flair Polka Dot linen... choose any floss color you wish for this. The basket is full of teeny motifs, finishing approx 5 x 5. 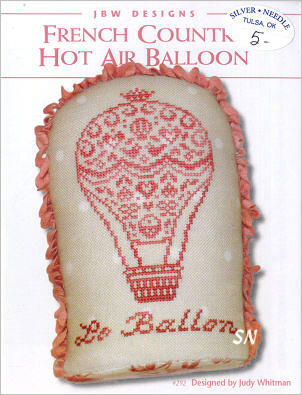 French Country Hot Air Balloon -- Choose a pretty color and add the words in either English or French... this is stitched on 32ct Polka Dot Linen... over one thread or two! 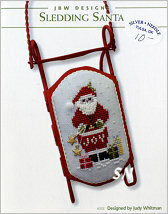 With a stitch count of 203 x 155, this is worked with 12 different shades of DMC and hand-dyeds. I just Love it! Offered as a chart, if you want your finished piece to appear more distressed, begin with a mangier fabric, or coffee stain your finished treasure! 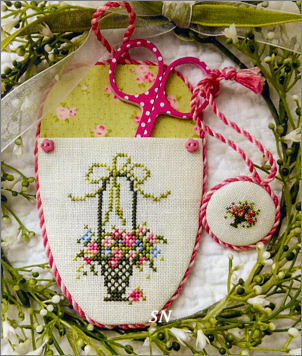 Antique Vases Needlework Accessories: This card features take-out designs from the Antique Vases Sampler. 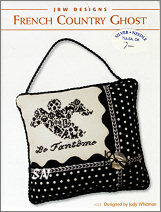 The large sewing case features Tan Polka Dot fabric from Fabric Flair. 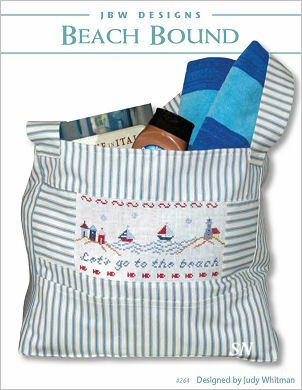 Measuring approx 4-1/2 x 6 when closed, the inside and back all feature gorgeous fabric and a trio of pockets to hold tools and threads. The smaller case pictured is a scissor case. 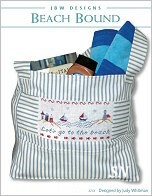 It features coordinating fabric to the sewing case and two interior pockets. It measures 3-1/2 x 4-1/2 when closed. The cases are sold separately from the little card. 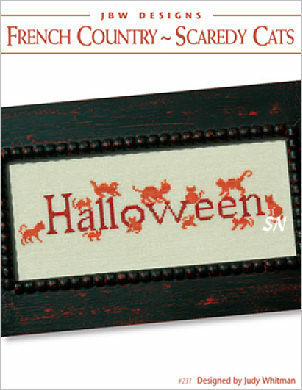 A 3-1/2 x 31-1/2 inch banner, this is stitched on Mill Hill's 27ct Orange Checkered Banding. Judy has stitched this with a whole collection of different oranges with the occasional greens for leaves and browns for the squirrels and other little creatures. 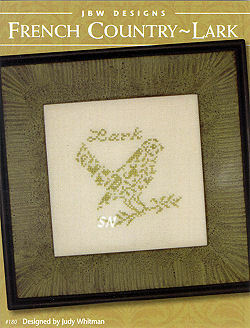 The picture of the finished piece in the center of the pattern shows this mounted against fabric for a table runner treatment. 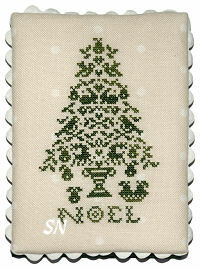 Christmas Pear Tree: Another of Judy's monochromatic French Country designs... lots of symmetry in this one. 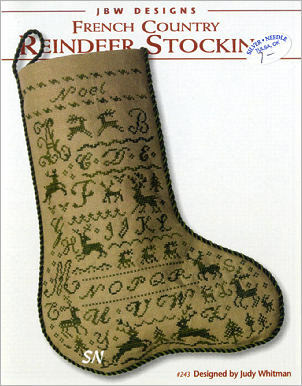 Reindeer ABCs: A long, skinny alphabet row... this coordinates with the Great Pumpkin, Abc's and Christmas Trees, and Alphabet Hearts. 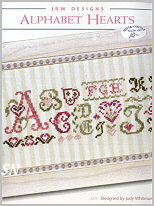 I love the striped fabric from the Alphabet Hearts -- think about choosing that for this one, too! 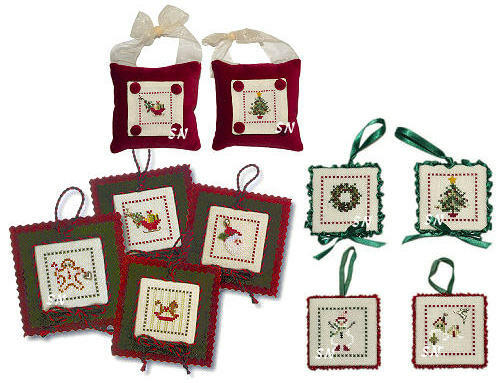 Vintage Ornaments: Skates, a sleigh and toys, Judy has chosen older, brighter colors for these -- to make them look faded and simulate those 1950's colors in your Mom's old Christmas decorations! 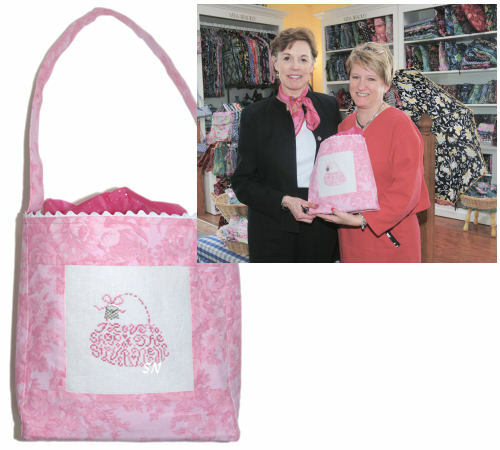 Judy's Summer 2013 Releases are here! 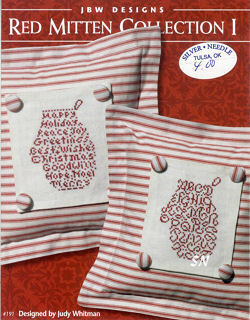 Patriotic ABC's -- REAL cute -- lots of small motifs, great denim, gray and cranberry shades, garnishments include 9 or 10 white buttons scattered throughout. French Country Wedding Cake -- Just a little something for a wedding remembrance. 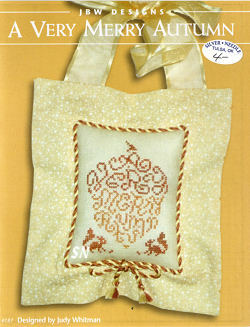 French Country Pineapple -- Very traditional... the hand-dyed flosses really make this design POP! 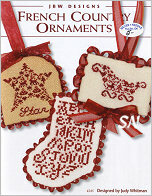 Wreath Ornaments III, II and I -- Six different wreath ornaments that you can stitch over one or two threads... embellishments are included for each larger version. 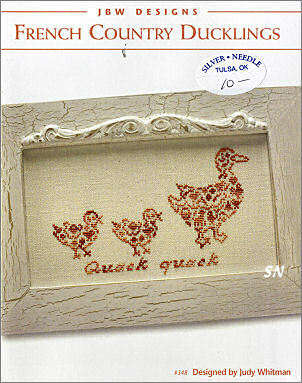 Judy has been busy with more tiny animals. Petite designs... choose one color of your favorite hand-dyed thread for each. The poodle and umbrella are stitched on the Fabric Flair printed fabric that is a light beige with white polka dots -- so slight -- you might have missed that in the pics. Alphabet Hearts is larger -- it finishes approx 3 x 14 on 32ct Neutral Parisian Stripe fabric that is actually a printed stripe of beige and white. A selection of 6 pink and green overdyeds in this one... it is charming! 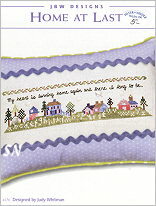 Home at Last is a long-requested re-release. It has been retired for several years, but no longer! 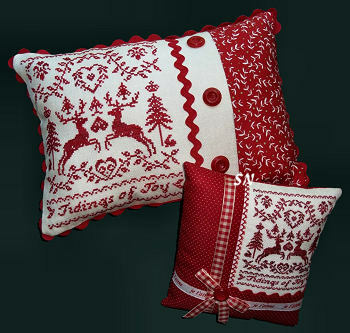 Just a nice collection of small designs, we have to get our hands on the new fabrics featured! 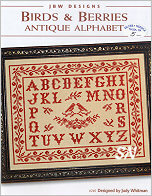 Judy has a lovely antique cross stitch sampler worked in 1911 by a young girl in central France. She's done some research about the stitcher and her hometown -- Romagnat -- and included that info in her pattern -- her adaptation of the original piece. 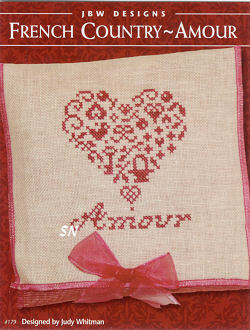 Lovely, this is worked in only two colors of hand-dyed cotton and finishes approx 12 x 17 on 30-ish count linens. 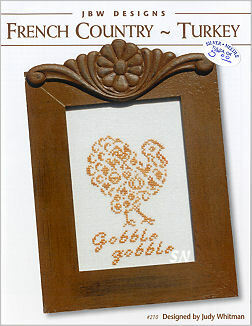 Very traditional, very pretty... something classic for your walls. Offered as the chart. 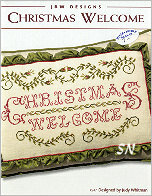 JBW Releases Celebrate Christmas 2012! 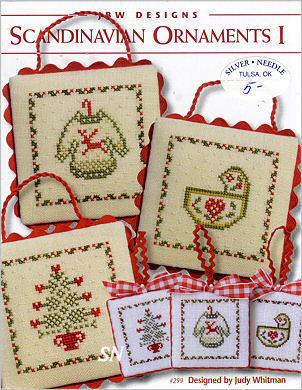 Judy has 6 new small designs... some doves for the tree, and some darling miniature stockings are both shown as ornaments. 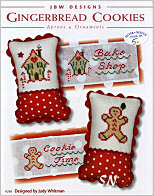 Gingerbread Cookies features two smalls that would also be cute ornaments, apron panels, or even little wedge stand-ups for the kitchen window sill. 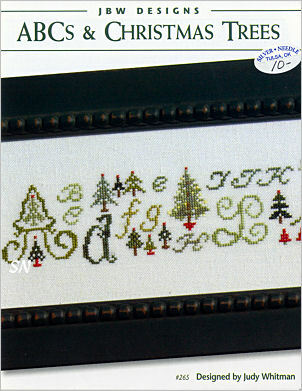 ABC's & Christmas Trees is a new lonnnggg alphabet to coordinate with JBW's recent Halloween Alphabet, but not quite as long, so she could package it in small card format! Always cute things, all JBW's designs are offered in her small card format, and are easy on the stitching time!!! 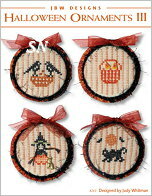 JBW has a new set of small Halloween designs -- 12 in all -- that finish into small 2-inch rounds. 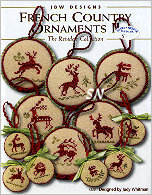 Stitched on Light Sand 32ct linen in either overdyeds or DMC's... the models are mounted onto fabric covered rounds, and trimmed with festive cords and ribbons. You can see orange stripes in the backgrounds -- that's not the fabric -- it's your stitching. 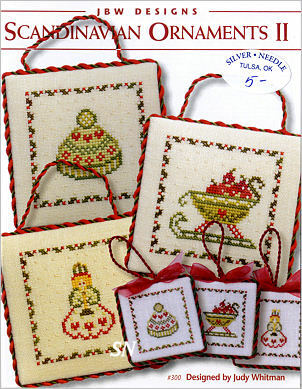 Offered in a trio of 3 small cards, each with it's own embellishment pack of charms, beads and clay buttons... real cute! A delightful little beach cabana scene... complete with lighthouse and sailboats. 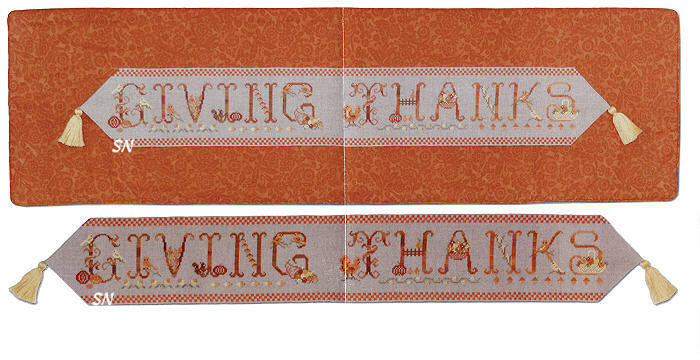 A mere 51 x 117... offered as the small card. No extra embellishments called for. 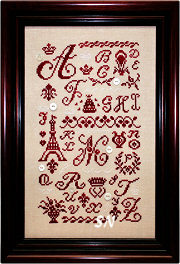 A fun lonnnggg, skinny alphabet, this has a stitch count of 28 x 316! Finishes approx 2 x 20 on 32ct!!!! 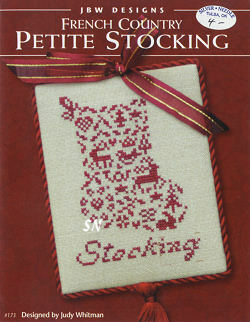 Stitched in a few hand-dyeds, raid your stash for cute embellishments to add to this! A plump little guy with pumpkins, more owls, birds, trees and baskets hidden in his tummy, he joins JBW's huge collection of pretty animals and motifs -- all with this lacy appeal. Offered as a small card. Little bunnies everywhere -- this is darling! A scattering of alphabet letters, a lovelycollection of mother-of-pearl buttons, and all those rabbits, this piece finishes a nice 5 x 13 on 32ct Belfast!!! 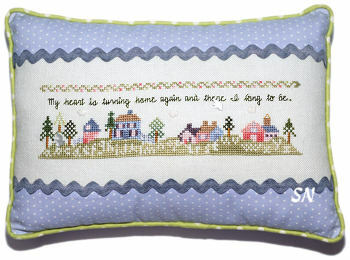 Stitch it on any fabric you with, in any color you wish -- you could even add some family heirloom buttons from your Grandmother's sewing basket. 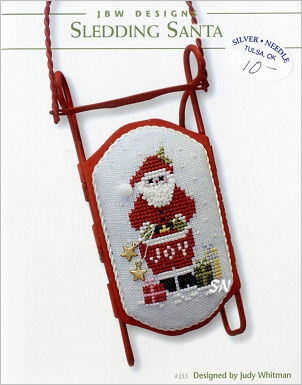 Offered as the small Card chart with button set. Oh, these are so cute! Such a precious birth announcement... PAY ATTENTION to the softly striped pink and blue linen fabric! Specially screened on there -- Fabric Flair has created this pretty fabric treatment just for Judy! The palest pinks and blues to begin with, they have taken the 28ct linen, and screened it with *JUST A TOUCH* of a darker stripe. Another pretty fruit! Judy has manipulated the thread so that the darker area of the skein is on the right-hand side -- see how it looks different in shade there? Makes the berry look round! Wow... this is really European in flavor... just lovely. 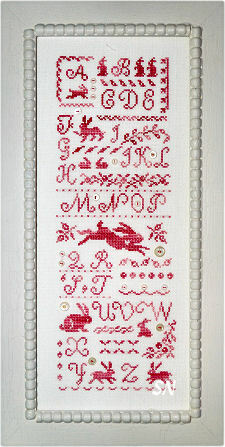 Soft floral bands, the scrolling alphabet, very simple cross stitch, this finishes approx 7 x 8 on 32ct Belfast. Again, choose a thread color of your choice -- the hand-dyeds are perfect for this look. 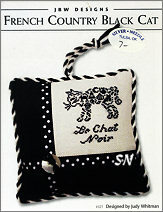 Offered as the small card chart. A hopeful reminder... JBW is donating proceeds from the sale of this chart to the American Cancer Society. 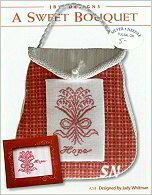 She has dedicated this design to all of our families and friends who are facing cancer treatments. JBW has introduced three sizes of spectacular sterling silver mini-frames that can double as jewelry pendants or Christmas Tree ornaments. 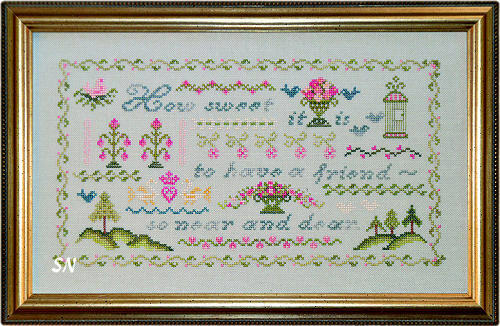 Remember her tiny hearts and trees... when you work them over one thread, they fit PERFECTLY into these frames! Very heavy in feel, elegant in look, choose almost anything tiny for these, and it'll look great. Shiny sterling, you might see a red and white checkered bow attached to the tops -- that is simply ribbon -- change it if you like to match your new piece! Tree opening measures approx 1-3/4 x 2. Heart measures approx 1-1/2 x 1-1/2. These are just lovely... get looking into your stash for other designs you might have for these, they are definitely heirloom quality. Judy Whitman has sent a set of Christmassy designs. The Reindeer Stocking finishes approx 9 x 12 on 28ct Dirty Linen -- little reindeer scattered everywhere in between a lovely array of different fonts of the alphabet. You can make miniature reindeer ornaments to match the stocking... or those tiny hearts! 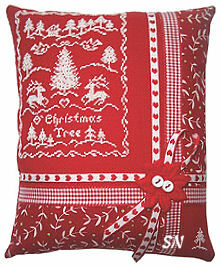 Hint: Judy's assistant just finished stitching this in red flosses on very light fabric, and it's stunning! 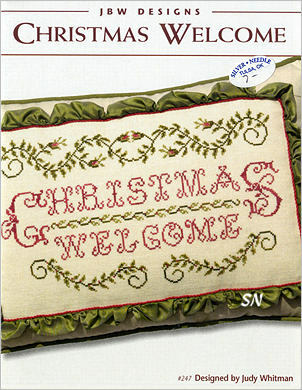 Christmas Welcome is a full-sized pillow -- the stitching area is almost 7 x 11 on Belfast. 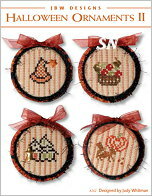 JBW has 5 new Sweet Nothings Releases -- Christmas and Autumn -- which seem so far off in the future! Some of the pieces are beautifully framed... and the rest are finished by our very OWN Mona! #240 Birds & Berries is a simple monochromatic alphabet -- this could be a 'study' of one or two really awesome thread colors! 7 x 9 on 30ct. 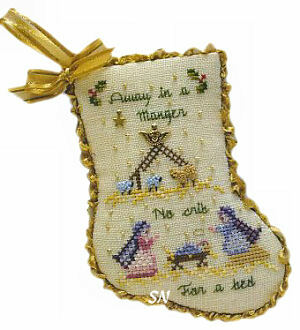 #241 Christmas Bells features all sorts of tiny motifs hidden in the scrolling curls decorating the bells. 4 x 4-1/2 on 32ct. #244 French Country Squirrel -- Look for the hidden birds, owl, pumpkins and berries, his favorite acorns are in a different color! 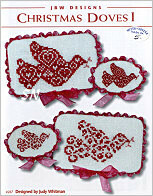 #245 French Country Ornaments -- More hidden motifs, Judy has a growing collection of tiny stockings, so try to find some of the others on our JBW designer pages. They make a cute set of shapes, just like Judy's mittens and trees. 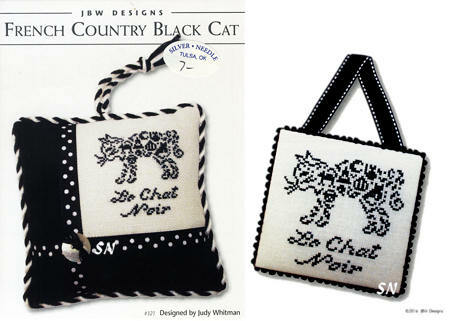 New Releases from JBW Designs! Judy Whitman has been busy! Six new Sweet Nothings; Babies, Weddings, the Winter Snow, and even the family dog! 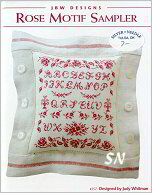 Heirloom Baby Sampler is stitched on a variety of pastel 28ct Cashel Linens... you could use just one color, and backstitch some 'boxes' if you'd like. 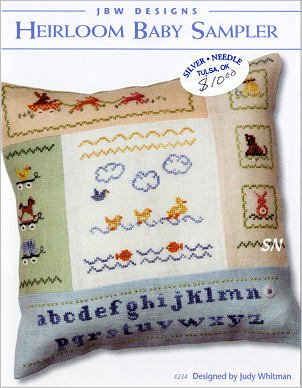 We have a pre-sewn sham available that features a push-button electronic music box, too. Each panel is decorated with a few asst buttons. 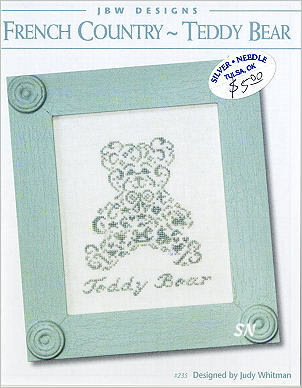 The little Teddy Bear is cute -- he's filled with tiny baby motifs. 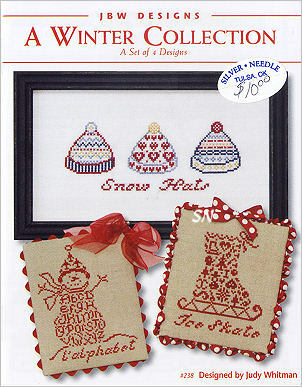 The Winter Collection of hats, snowman and skate is cute, Snowman comes with either the alphabet hidden on him OR tiny wintery motifs. Of course, MY personal favorite is the Scottie Dog design... he can be finished oodles of different ways, isn't he precious? 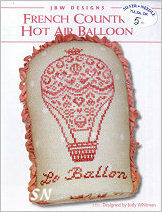 All are presented in small Sweet Nothings card format, some have button embellishments. 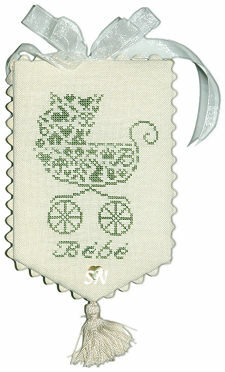 Note: 5-Panel Linen Pillow Sham for the Heirloom Baby Sampler measures 9 x 9 and is a medley of Antique White, Apricot, Mint Green, Baby Lotion and Blue. The panels are NOT sewn absolutely, perfectly, straight on the linen threads. It is well done, but NOT perfect. If you are *picky*, please purchase individual linen pieces to assemble yourself. You may not be happy with the pre-sewn option. 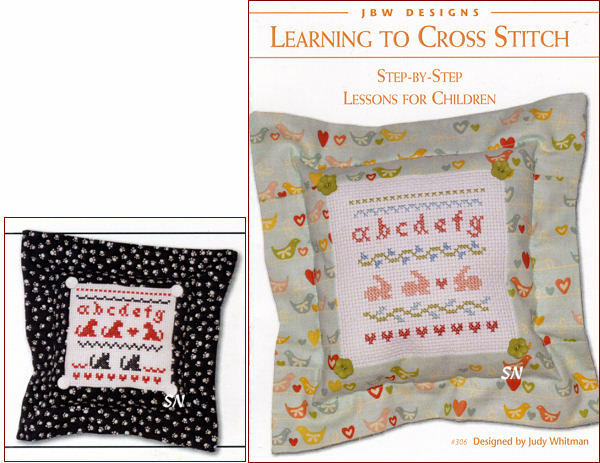 JBW Designs has 6 new releases! 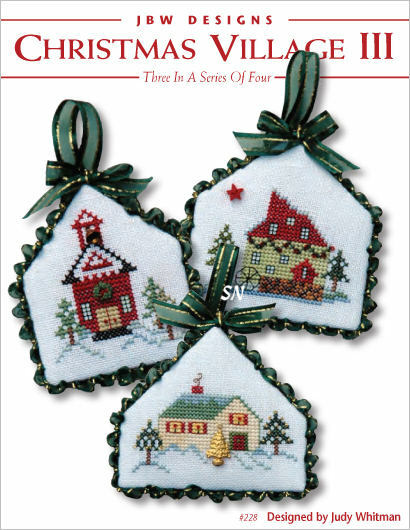 Finish your tiny Christmas Village with a church, mill, covered bridge, and schoolhouse... Scaredy Cats is shown stitched all in oranges, but think about black cats, or metallic or furry cats... or overdyed lettering... or all black! Judy has released 6 new cards.. the villages come with embellishments. 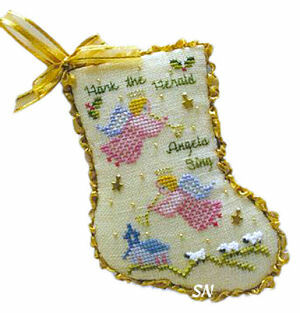 They're all cute, the stocking really compliment Judy's tiny tree collection, the angel is timeless, and those little kitties have so much potential, they ARE scary! Offered as small cards. Christmas is Coming... and we have the trees to prove it! 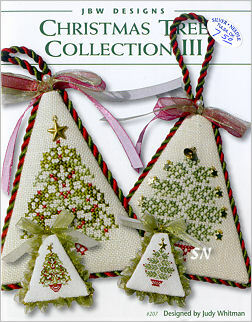 JBW has released 4 additional tiny Christmas Tree designs -- to bring this charming collection to 6 cards of 2 trees each for a total of 12! 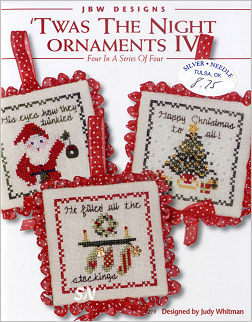 All finishing either 1 or 2 inches in total size, each is different and quite charming! Hidden motifs, tiny charms to top each, and Mona's cute rouched ribbon finishing treatments... HOW can you pick an absolute favorite from this set? Each card offers 2 different trees, shown stitched over one or two threads. Models are exquisite... and some reside at The Silver Needle! Scroll down to see Judy's other new releases! 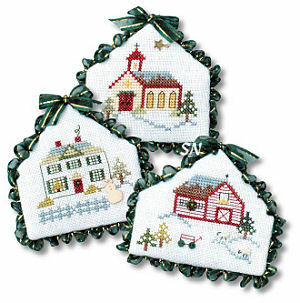 Just like the 12-Days of Christmas... this is another 12-part set of tiny village houses, churches and businesses. 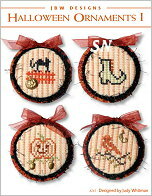 3 Designs to a card, each finishes approx 30 x 40 stitches and is embellished with a button of some sort. Even though our very own Mona is not credited with the model finishing... you'll see her charms displayed beautifully on each cover! 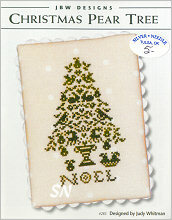 Offered as the card of 3 designs with embellishments. 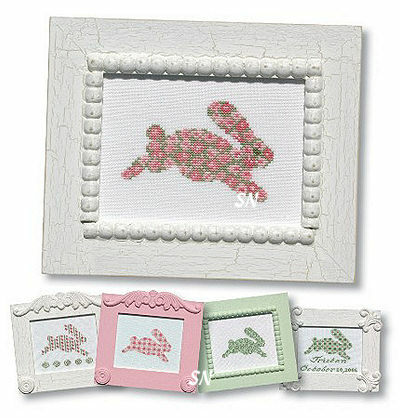 This is a cute set of running bunnies -- all are the same -- except that they are all patterned differently! Floral, Gingham, Plaid, Striped and Alphabet bunnies... match their colors to the nursery theme! Each with a stitch count of 40 x 55, you can stitch them individually, add some personalization for a baby announcement, repeat, stack, just anything! The chart includes an upper and lower case alphabet and set of small numerals, and these will be cute on just about any count of fabric. 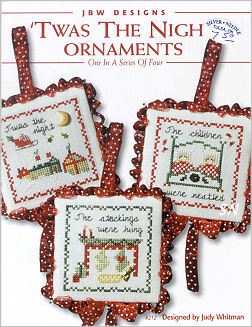 Judy Whitman has finished her 12-piece set of Twas the Night Before Christmas designs... all at one time! (Card #1 was released last Fall... we now have cards #2, 3 and 4!!!) 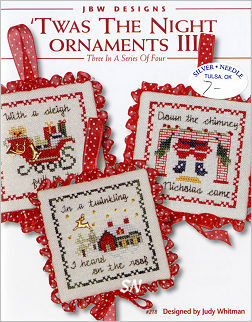 Following the verses of the famous poem about Santa's midnight visit, each tiny 2-1/2 inch square ornament features a bit of the verse, and a coordinating picture to tell the story. JBW has 4 new small designs... I think the Noah's Ark birth announcement is cute, all the chicks and flowers hidden in the butterfly are fun, and I like the scallops on her edges. All are offered as small cards, none have embellishments... just easy, nothing fussy! Four more darling little evergreen trees... EVERY one of these is really cool... and together, they make quite an eyecatching site! Our Mona has finished them, with twisted cording on the larger 3-inch-ish pieces, and rouched ribbon on the babies. 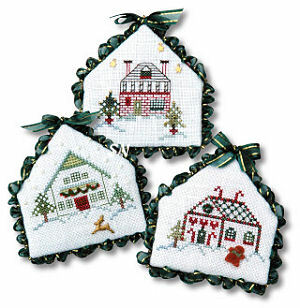 I don't know why, but the included embellishments DO NOT include those for the smaller versions... you'll need to rescue a few beads from your stash instead! Cute, cute! 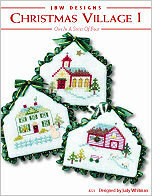 This is going to be a DARLING set of ornaments... following the story of The Night Before Christmas! 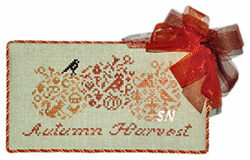 Offered as the small card of three charts, with embellishments for each, I imagine the other three parts will become available between now and next Spring. 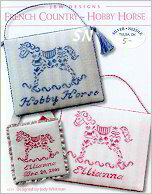 Each design is 39 x 39 stitches, and all are charted for either DMC, Crescent Colours or Weeks hand-dyeds. What a fun set to scatter about the tree... your little ones will have to search and search for all of them to tell they story! They'd be cute on a wreath, too! New designs with all those tiny motifs hidden everywhere. It would even be pretty on the opalescent 10ct Tula fabrics -- done in perles , few beads scattered here and there -- and used as a candle mat! Each of these is offered as the small card, no embellishments featured. Just fun little designs! 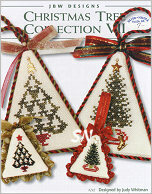 Tiny Christmas Trees from JBW are here!!! 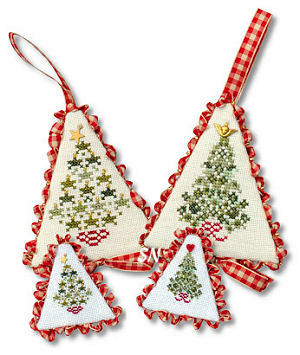 Judy Whitman has 6 new releases, a cute pumpkin, and a lovely wedding pillow among them... but my very favorite is this pair of tiny tree ornaments! 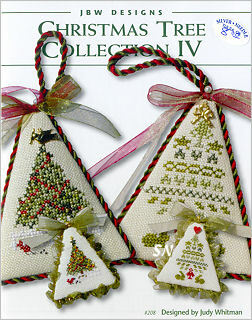 Offered in two different cards, each containing two different trees... they are precious! Averaging 25 x 35 stitches... you can work them over two and they'll be 2 x 2-ish. 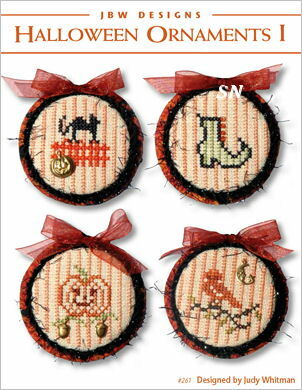 BUT, if you do them over one thread -- they are miniature little bits of stitching ART! Our Mona did the finishing for all of them, so we all got to hold these darling things in our hands the day she was shipping them back to Judy! 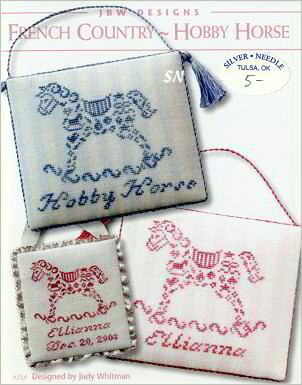 So teeny, so cute, prices vary due to embellishments that are included. Make sure to see the rest of JBW's newest things, shown right below! 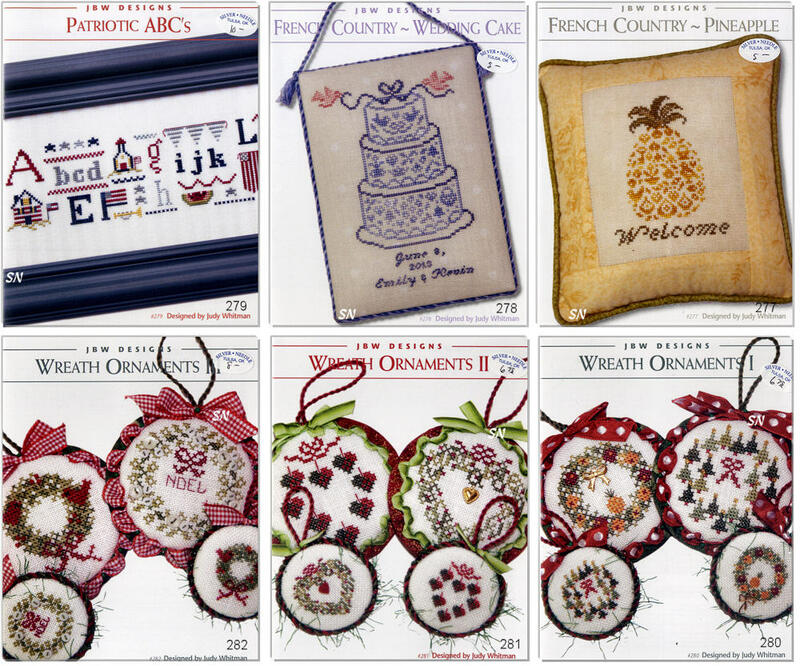 Lots more of Judy's Country French-inspired designs... each can be stitched in any number of pretty overdyed threads of your choosing... makes it fun to check what's in your thread stash! 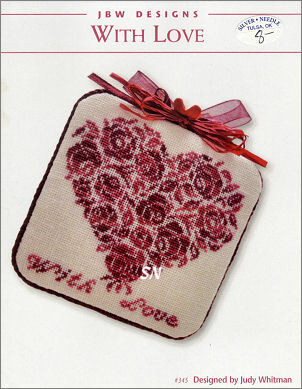 All are offered as Sweet Nothings cards with any necessary embellishments. Bunnies, cats, chicks and an umbrella... crowns, stars, bows... all of that is hidden in the delightful little carriage! 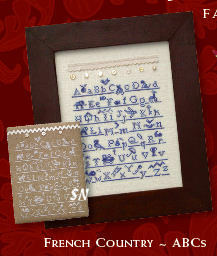 No alphabet is provided for extra personalization... but I'm sure you have a good one from another Sweet Nothings design. A colorful row of tea cups offering your choice of tea, chocolate or cafe? Finishes almost 4 x 9 on 28ct... pretty in a breakfast nook! Two more darling designs that hide their sentiment into the shape of the main motif. 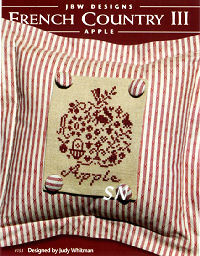 I Love Christmas Shopping is hidden in the purse design, and This the Season to be Jolly is hidden in the tree shape. 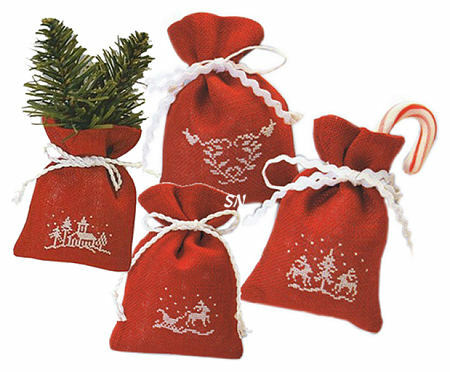 This purse design comes with a brass holly charm, and the tree piece comes with a red clay star tree-topper! 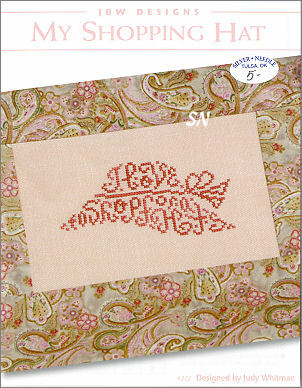 Of course, at The Silver Needle, we are *very taken* with the Shopping Purse, because Judy did US a freebie chart (For You guys!) 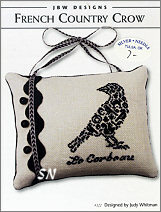 of a purse that reads: I love to shop at The Silver Needle! 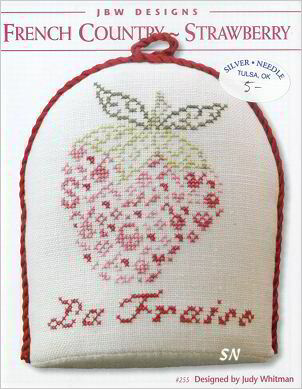 Free with any purchase, it even comes with a tiny purse charm! 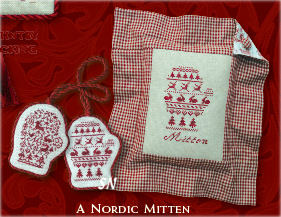 Pick your favorite mitten... we have 4 singles here.... no matching sets... just like real-life!!! Collection I features words and alphabet letters hidden in each. Collection II sports motifs... and if you're really good... they can be reversed, so you CAN produce a matching pair! 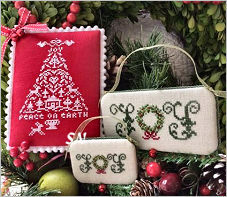 Stitched in only one color of hand-dyed thread, choose a rich red or green, and finish as ornaments, pillows or pictures. Each finishes approx 3 x 4 on 28ct, but over one thread... they are miniature bits of wonder! 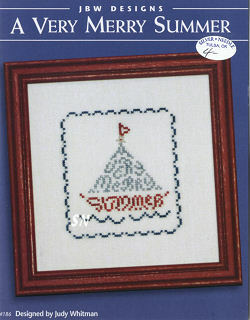 More Charming French Country-inspired designs by Judy Whitman... the summer sailboat is cute, the autumn acorn is fun. 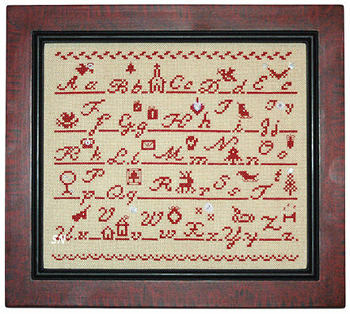 Christmas Alphabet features tiny motifs for each letter, (her stitch key tells you what they all are!) 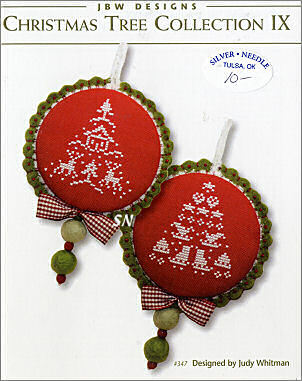 and an embellishment set of 8 teeny buttons. 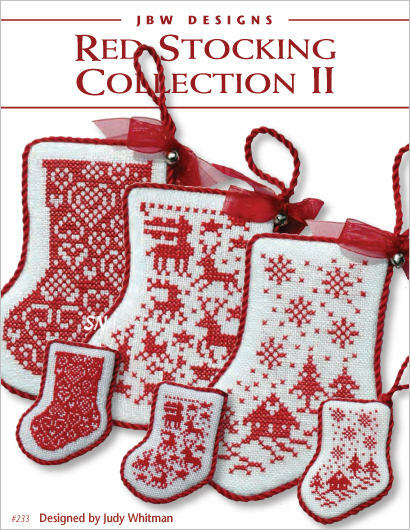 It finishes approx 8 x 8 -- slightly larger than the rest in this set of releases. 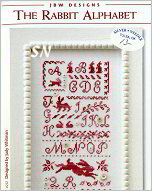 Here we have quite a fun collection of animals and motifs stitched in this same miniature, scattered, teeny-tiny motif theme that is so charming! 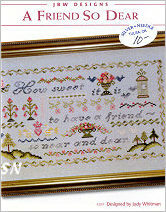 Offered as a Sweet Nothings Card, stitch 'em over one thread on something small -- they are awesome! (and remember that each uses only one color -- and you can choose it!) Our very own Mona finished the Amour scissor fob and Lark Boxes that are featured as alternative finishing options on each card -- pretty neat! Re-charted and 'fixed' for current threads and fabrics, each used to be a separate card, for at least $4 each, but now... you can get the complete little 'album' for $14! Two of JBW's newest releases... as you can see, we have 4 in all! 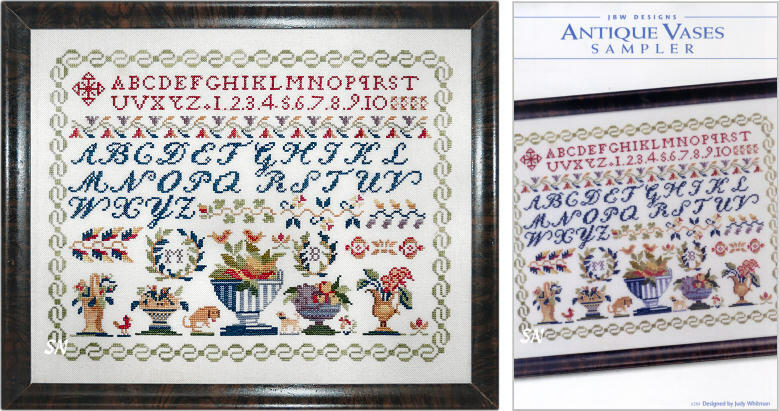 The ABC sampler can be done on your choice of fabrics in any overdyed color you love... the sampler is embellished with lace from your antique stash, and buttons that come with the pattern. 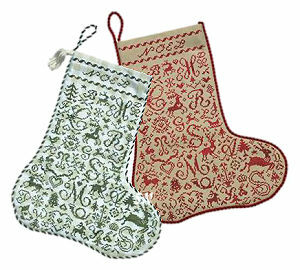 French Country Bunnies, Stockings, Christmas Trees and Mittens! 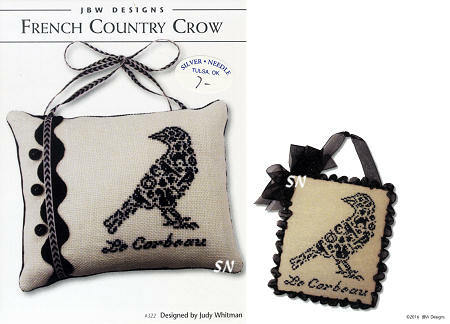 Judy Whitman has released new Sweet Nothings French Country-inspired designs. Each is offered as a small card... each is stitched in a monochromatic color scheme of one overdyed floss, delicate and lacy. Lots of finishing options are available to you. One of my personal favorites is the black and white pillow option. Remember you can always give us a call for some personalized help. Note from Mary: Since Judy has both a Rabbit and a Bunny design, I've added a couple of words in those dropdowns so the gals at the shop are certain which one you want. 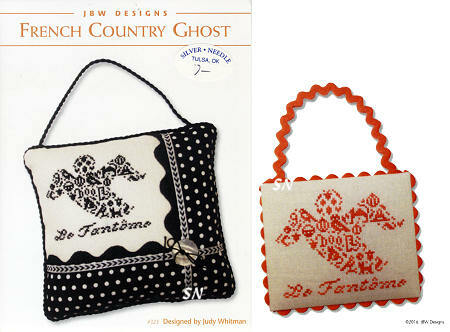 JBW has released several new things... this rooster and cat are the latest in her French Country set of designs! 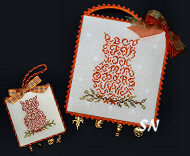 Offered as small card designs, look at the animal bodies... they are a tiny medley of motifs and letters! 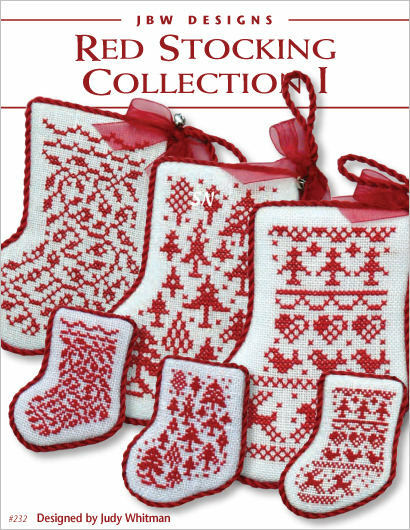 Each design in this set is stitched in only one color of overdyed floss. The color variations in the thread give you lots of interest, and make it appear as though you've changed thread colors over and over again! Very Elegant! 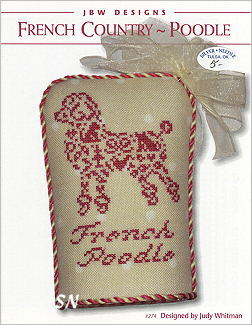 By the way, all these country french things would be GREAT in black on white, and then finished onto this classy pillow!!! 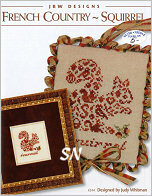 The main calendar finishes approx 19 x 13 stitched on a cream or white Cashel Linen. 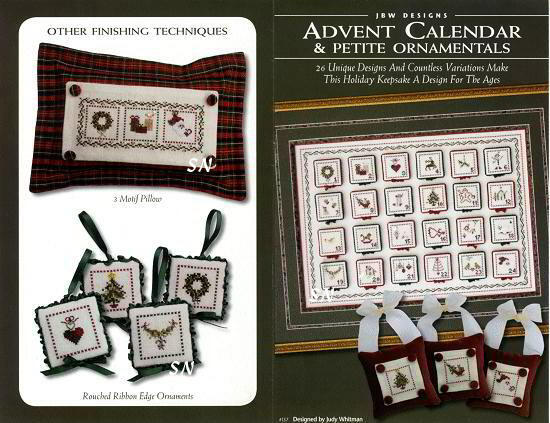 Each individual ornament finishes a bit smaller than 2 x 2.There are several other options for everything, as shown in the pictures. Think about the individual cranberry velveteen tie pillows -- they measure 5 x 5. 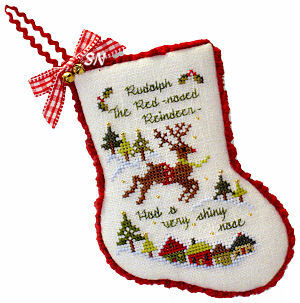 Then, there is a red, green and black flange pillow -- approx 7 x 12 -- that fits three ornament designs with part of that pretty main border. 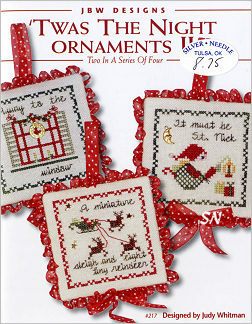 What about finishing the ornaments individually any number of ways? The sky's the limit with this! Two more fun designs in the Sweet Nothings small card format... Apple is shown on the same 10 x 10 Berry and Cream striped pillow as Rabbit and Lamb, while Pumpkin is shown on a luscious Fall-colored plaid pillow. Both are stitched using only one color of hand-dyed floss, and finish approx 4 x 4. 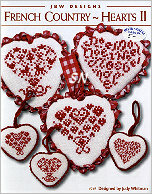 JBW has released a great new set of Sweet Nothings designs... and Rabbit and Lamb are the newest pair! 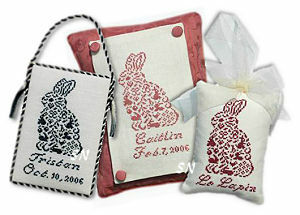 Stitched in one color -- your choice of several overdyeds that are listed as options -- Rabbit finishes a petite 3 x 3-ish. 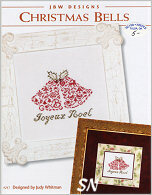 Each is really made up of tiny flowers and motifs hidden in the shape of its French Country inspired design! 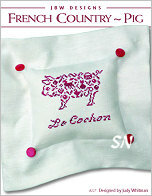 You could get creative and change the stitching color to match Gingham Linen... or your decor. I think our pic takes you to several other design options with these. 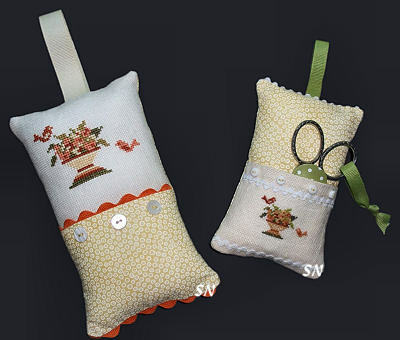 Offered as the small Sweet Nothings Cards, pillows separately, make sure to see the rest of Judy's newest designs -- they are all really good! This is one of the prettiest JBW Sweet Nothings to be released! The delicate, multi-colored florals for Mother, Sister, Aunt and Grandmothers have always been our favorites around the shop! This one is stitched in plain DMCs and features single white stitches of #12 perle cotton, which really stand out as tiny bits of texture!